35-year-old Thu Zar Myint looks small and diminutive in the hospital bed, dwarfed by the padded sling for her left shoulder and the casts on her legs. Her right arm is about the only thing she can move freely without much pain, but even that arm has a big bruise and a dressing on it. Thu Zar Myint came to Singapore in August this year. Her friends, already working as domestic workers in the city-state, told her that it would be a good opportunity. She wasn’t aware that Myanmar had already imposed a ban on sending Burmese women to Singapore to work as domestic workers. She thought of her teenage son. “He’s doing well in school, so I wanted to earn more money to give him a better education,” she said through a Burmese translator. Her husband earns a modest living as a motorcyclist carrying passengers in Yangon. Working in Singapore would give her boy a better chance of going to university. She found a recruitment agent in Myanmar who would help her get to Singapore. She was trained in childcare, and told that she would earn S$464 (approx. USD364) a month working with a family with a seven-year-old child. She asked to be placed with a Chinese family – she had been taught to cook Chinese dishes, and had learnt a few words of Mandarin to help her communicate. One month into her training in Yangon, her agent told her that there would be seven months’ worth of salary deductions to pay her recruitment fees, one or two months more than she had expected. Thinking that she was already halfway through her training and would have a steady wage in Singapore, Thu Zar Myint accepted the increased cost. She had no idea that this decision would lead to her lying in hospital just months later, her body battered and broken. Once in Singapore, Thu Zar Myint was not placed with the family she had expected. She was instead employed by an Indian family with no young children. She signed a contract in English – a language she cannot read – where her monthly salary was stated as S$434 a month. The agent then deducted S$404 a month, leaving her with S$30. She asked to be transferred back to the agent after 10 days of work. She wanted a new employer; she had trouble communicating with the Indian family because she barely speaks English. Frustrated with her inability to understand, her lady boss verbally abused her. This lady boss would sometimes also raise her arm as if to hit Thu Zar Myint (she never actually did). Thu Zar Myint was fed three times a day, but said that sometimes there wasn’t enough – she would only eat the family’s leftovers, and sometimes portions were small. She was never transferred to a new employer. In fact, Thu Zar Myint claims that when she asked to be transferred, she would get locked behind a partition at night, separating her room – a small bed in a windowless storeroom – from the rest of the house. She says her employer did it about three to four times over the course of almost two months. She was told that if she tried to leave she would have to pay back her agent’s fee, or that the police would arrest her if she ran away without proper documents. There was no day off. Thu Zar Myint was told by the Burmese agent that she wasn’t entitled to a day off during her salary deduction period – a lie, as Singapore’s law now stipulates that domestic workers should have a day off a week (although employers are still allowed to pay them in lieu of off days). Her day would begin at five in the morning. She would wash her employer’s two cars, clean, cook, move flowerpots in and out of the sun and make beds, among other chores and duties. She would eventually go to bed, tired out, at 10 or 11 at night. There was never any time throughout the day to return to her room for a break. Things came to a head on 13 October. “My employer said that they might send me back to the agent, but weren’t sure when,” she said. 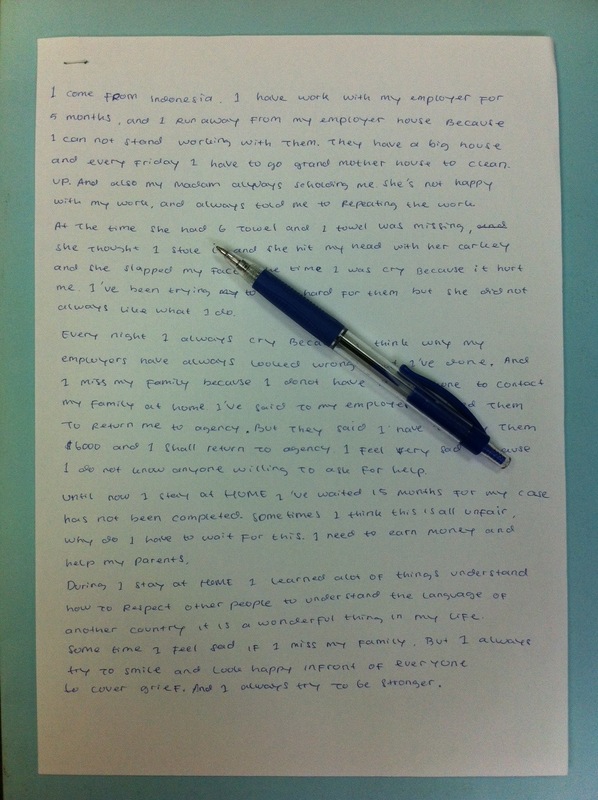 Her employer took her work permit and the S$30 that was all the money she had earned in Singapore. But she never went back to the agent that day. She said she was locked behind the partition that night. At two in the morning, Thu Zar Myint took things into her own hands. Her only exit was a window in the toilet next to her room; she could not get to the main door beyond the locked partition. So she went out the window, five storeys up. She slid down a drainage pipe the first two storeys. But then she fell. She now lies in a hospital bed at the National University Hospital, better known as NUH. Burmese-speaking volunteers take turns visiting her, so that she’ll have someone to talk to. Nurses told her that she’s damaged her spine. She has a scar on her right leg from an operation and a steel rod in her left foot. The cogs continue to turn in Singapore, and like so many other migrant workers Thu Zar Myint has been caught up. Efforts are now being made to send her home. She told volunteers on Friday that she had been asked by hospital staff to sign a document consenting to being sent home to Yangon, where she would then be admitted to a Burmese hospital. “They told me to try to go home,” she said. She signed the document, but still isn’t clear about what will happen to her – the document had been in English and she hadn’t had a translator. On Saturday morning she was told that they were going to send her back on Monday. It’s unclear if she’ll get her wish. HOME, an NGO for migrant workers’ rights, is appealing to the Ministry of Manpower on her behalf, as well as trying to raise funds for her medical care once she’s back in Myanmar. But regardless of HOME’s success or failure, one tragic fact remains: Thu Zar Myint’s gamble – leaving her home and family in the hopes of better opportunities for her son – has not paid off. HOME welcomes statements by the Attorney-General’s Chambers (AGC) that it has formed a working group to focus on expediting the prosecution of employers who abuse their domestic workers and to look into compensation options for victims (“AGC studying ways to speed up cases involving abused foreign workers”, The Straits Times, 4 August 2014). However, more must be done to assist abused foreign domestic workers in Singapore. The slow pace of abuse investigations in Singapore takes its toll on victims of abuse. As The Sunday Times reported on 3 August 2014, HOME’s shelter hosts abused domestic workers who must remain in Singapore to assist investigations. Many are stuck here for years. This long wait has a heavy impact; emotionally, physically and financially. Whilst speeding up the investigations would help these women get home sooner, this is not enough. As AGC recognises, abused foreign domestic workers in Singapore deserve compensation for their ordeals. However, the compensation framework needs to be streamlined and standardized. Further, compensation assessments must reflect the trauma and abuse suffered by a worker, as well as upkeep and opportunity costs. Most abused domestic workers rely on organizations like HOME to provide them with food and shelter, despite employers’ obligations to meet these needs under the Employment of Foreign Manpower framework. In addition, every day that a worker waits in our shelter is one in which she is not earning any salary. Through no fault of their own, abused workers are left with no way to support the families who are waiting for them back home. Thus, it is crucial that victims of abuse are given a decent opportunity to work while they wait. Currently, abused domestic workers are unable to work in other sectors, but many tell us that they are afraid to work in another household after the trauma they suffered. Allowing these women to work elsewhere (for example in the service industry) would allow them to productively use their waiting time; alleviating a heavy financial and emotional burden. HOME is heartened by AGC’s commitment to improving the plight of abused domestic workers in Singapore. We hope that the working group recognizes not only the need for abuse cases to be concluded more quickly, but also for domestic workers to be given fair compensation for their ordeals and a fair opportunity to work while they wait. Idiyah* came to Singapore to earn money to support her family of six in Bandung, Indonesia. She knew about the nature of the job, and was prepared to work hard, but nothing could prepare her for the physical abuse, constant surveillance and complete isolation that awaited her. Idiyah was not allowed a hand phone, to call back home or even talk to the neighbours. The only time Idiyah, who did not have a day off, left the house, was when she was sent to her employer’s relative’s place for additional household chores – illegal deployment, which is not allowed in Singapore. Apart from that, Idiyah was trapped in her employers’ three-storey bungalow. Things got worse when her employer suspected Idiyah of stealing one of her towels, and hit her on the head with a car key and slapped her face. Distraught, Idiyah requested to be sent back to her agent. “But they said I need to pay them $6000 if I want to return to my agency”. Idiyah was still paying off agency fees, and received only $10 allowance per month. She was trapped. The next time her employer hit her with a broom. One Sunday morning Idiyah ran away to seek help at the Ministry of Manpower. A friendly cab driver brought her to HOME at Orchard Road instead. Idiyah stayed at the HOME shelter while her cases for illegal deployment and abuse were investigated. Idiyah expected it to be a speedy procedure but ended up waiting fifteen months for the investigations to be completed. During this time her father suffered a stroke, but Idiyah had to remain in Singapore while the investigations continued. Despite the difficulties, Idiyah found solace in the activities at HOME’s shelter; she learnt sewing, and volunteered at HOME’s Waterloo Street office, assisting other migrant workers. Hers was always a smiling in the office and she found joy in helping others in a position similar to hers. In the end, Idiyah decided not to press charges against her employers for the abuse, as she did not want to prolong the wait. Idiyah has returned to Indonesia but wants to come back to Singapore to work. Despite her experience, she has grown a lot, and during her stay at HOME improved her English, gained confidence, and made friends. She even learned some Tagalog from her Filipino friends! Idiyah believes she could now deal with whatever challenges may come her way. Idiyah made the most of her time at HOME’s shelter, but the frustration and anxiety that she experienced during the fifteen-month wait for her case to be resolved were hard to endure. Underneath her smile, she was in pain. Singapore does not have a comprehensive victim protection system to ensure that workers like Idiyah have adequate social support whilst awaiting the outcome of their case. Apart from this, measures to speed up the processing of investigations need to be implemented to ensure that victims are not themselves ‘punished’ again with long waits during which they are unable to provide for themselves and their families.